Are you a developer of high-tech embedded devices, mobile systems, or a manufacturer of IoT-enabled products? The development of embedded systems is a complex process, further complicated by the new industrial revolution that the Internet of Things is propelling. 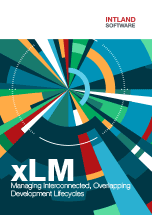 Managing multiple parallel lifecycles, and connecting PLM and ALM are becoming crucial. codeBeamer ALM is a future-proof solution to these challenges, and its TÜV certification proves that it adequately supports the development of safety-critical embedded and IoT products. codeBeamer ALM’s advanced process approach allows you to achieve high product quality, traceability, and compliance in the development of complex embedded and IoT-connected products. Out-of-the-box integrations and a flexible API enable you to manage hardware, software and service innovation while maintaining data consistency, mature process control, and visibility throughout the lifecycle. achieve integrity, consistency, traceability across sophisticated “system of systems” product lifecycles. Learn how to integrate the parallel lifecycles of hardware manufacturing, software development, and service innovation using codeBeamer ALM. Smart products developed for the Internet of Things have long cycle times, combine hardware and embedded software components, and may have to be optimized for safety and reliability. The unification of ALM & PLM, and the integration of processes and data across tools and lifecycles are vital. Multiple product variants may be developed at the same time. Maintaining efficient collaboration between different disciplines and sometimes even outside suppliers is a challenge. codeBeamer ALM offers integrations with DOORS, SAP, MS Office solutions, Jenkins, and other widely used software tools out-of-the-box, and collaboration features to allow the seamless integration of processes. In IoT product development, different methodologies may be used for the development of hardware components (Waterfall or V-model), embedded software (Agile), and service innovation. codeBeamer ALM handles all of these, as well as scalable Agile or Agile-Waterfall Hybrid frameworks. Comprehensive risk management and quality assurance capabilities cover the entire overarching product lifecycle. 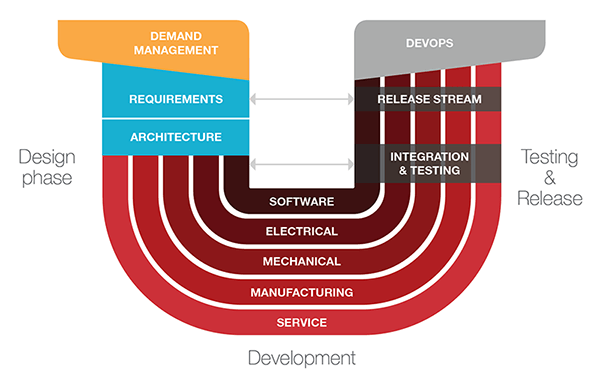 Spanning the entire lifecycle from demands and requirements management to DevOps, codeBeamer ALM helps unify all processes and data, while ensuring traceability, transparency, and compliance across IoT lifecycles. Using codeBeamer, you can dock your ALM into big data systems. codeBeamer’s advanced workflow engine with Business Process Management capabilities allow you to connect processes and data across tools (also integrating PLM), enabling you to manage the development of complex products in an integrated manner. Connect your ALM to big data systems. Extract meaningful data to fuel innovation. codeBeamer’s Variants Management feature set allows you to efficiently manage multiple product variants within your product line. It lets you reuse artifacts and processes to minimize rework. Hazards can be managed using codeBeamer’s comprehensive risk management capabilities. Configure codeBeamer ALM freely, allowing you to use any combination of Waterfall/V-model, (scaled) Agile and Hybrid processes in your development lifecycle. Learn more about how the Internet of Things has transformed users’ perception and use of products, and how companies need to adapt their innovation and development processes.